What may be most significant about the enduring classic, Our Town, is its reliance on a sense of transcendence. Although the time is the beginning of the 20th century and the setting the fictional small town of Grover's Corners, New Hampshire, this Pulitzer Prize work actually exists on a higher, less mundane plane: the timeless, unending universe and the eternal cycle of birth, home, marriage and death. At Long Wharf, which is celebrating its 50h anniversary, Thornton Wilder's great work lives awkwardly in a no-man's land. Director Gordon Edelstein particularizes the piece by employing principal players who have previously appeared at the theater, plus a dozen or so locals in non-speaking roles. The sense of community is switched: New Haven now, not Grover's Corners in 1901. Costumes are not period but as if taken from each actor's closet. Further, casting is color-blind: race doesn't matter and isn't commented upon. The idea has we're-all-in-this-together merit: who hasn't needed to be reminded that life must be lived in the moment? But Edelstein reduces the play by having the narrator not the usual wry Stage Manager who knows the New Hampshire town, but a woman (a hard-working Myra Lucretia Taylor) whose contemporaneousness and demeanor take her, and us, into a more objective, more superficial realm. The Stage Manager is no longer our conduit to Wilder's world, but a messenger who narrates from a distance. You can fool around with plays: look what they've done to Shakespeare. Even Our Town is open to interpretation, from Westport Country Playhouse's over-designed presentation some time ago to David Cromer's brilliant off-Broadway production a few years back. It's the small, little-noticed events that shadow most people's lives. Yet Wilder's is not a sentimental play but one filled with bitterness and irony. At Long Wharf, it's also a salute to the past, even to having photos of late theater stalwarts like Joe Maher and Joyce Ebert strewn among the dead. Edelstein's usual excellent hand when it comes to guiding actors does not fail him. Archetypal characterizations are deceptive: we know these people even as they remain remote. Jenny Leona and Rey Lucas are heartfelt as Emily and George. Don Sparks and, especially, the radiant Linda Powell bring soul to George's parents. Christina Rouner is a wonderfully efficient yet vaguely secretive Mrs. Webb, while Leon Addison Brown's Mr. Webb is amusingly folksy and Ann McDonough is delicious as the gossipy Mrs. Soames. On Eugene Lee's deceptively simple set, unobtrusively lit by James F. Ingalls, Wilder's memorably resilient characters enact a story of how ordinary becomes extraordinary. 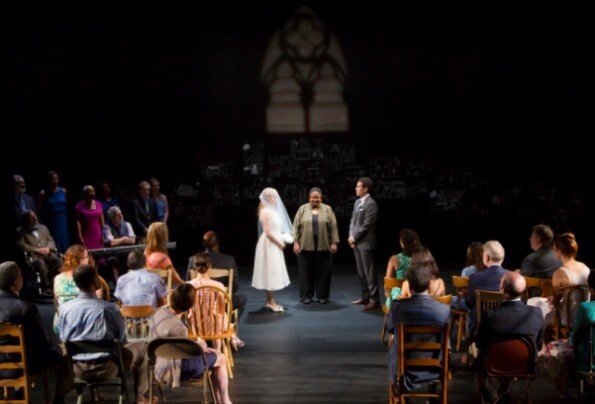 Although this is an opaque production of Our Town, the play still glows. Long Wharf Theater, 222 Sargent Drive, New Haven, Conn.